If you are running late or plan to check-in after 9:00 p.m. please, call us so we won't worry. Below, we list helpful information to beat the traffic. Take 65 South to 76 West. Go through the Strip and out past Shepherd of the Hills Tower (about 8-10 miles) to Indian Point Road. Turn to the left and by-pass Silver Dollar City, staying in the left lane that directs you to Indian Point. Go past the last parking lot on the left, by-pass the first right, and take the next right hand turn onto John the Diver Trail. Then follow the signs down to Bavarian Village Resort. Take 65 South thru Springfield and down thru Ozark. 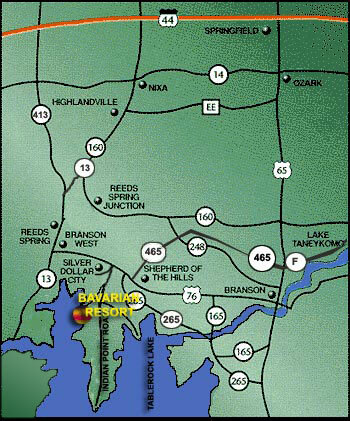 Before getting into Branson you will see a sign for the "Ozark Mountain Highroad" or 465 South. The exit number is 16 and it is right next to Pinegar Chevrolet. Take 465 South about 8 miles or so to 76 West (left turn onto 76). Take 76 West to Indian Point Road. Turn to the left and by-pass Silver Dollar City, staying in the left lane that directs you to Indian Point. Go past the last parking lot on the left, by-pass the first right, and take the next right hand turn onto John the Diver Trail. Then follow the signs down to Bavarian Village Resort. Take 65 North to 265 North. Go about 3 miles and it will merge with 165 for about 4 miles. Then turn left on 265 North for about 5 miles to 76 West. Turn left, go .6 mile, turn left again at Indian Point Road. By-pass Silver Dollar City, staying in the left lane that directs you to Indian Point. Go past the last parking lot on the left, by-pass the first right, and take the next right hand turn onto John the Diver Trail. Then follow the signs down to Bavarian Village Resort.